Russia is a threat to the sovereignty of Eastern European states and the Western partners are indispensable to cope with this threat. 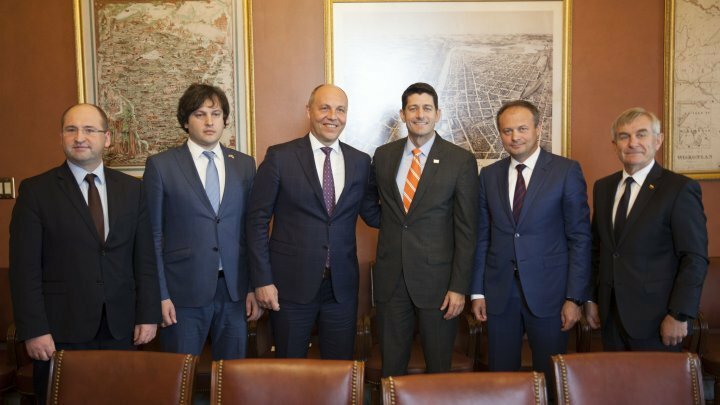 The conclusions belong to the presidents of the Moldovan, Georgian, Lithuanian and Ukrainian parliaments at a joint meeting in Washington. "The US support is really important in various aspects. We all face the same problems, and US support, regarding financial, politic, logistic, military supports, energy support like Poland, Baltic countries are crucial, "said Andrian Candu, Speaker of the Moldovan Parliament. The president of the Ukrainian legislature warned international opinion that the risk is not limited only to the countries that have common borders with Russia. "Each of these three countries faced Putin's aggression, and we came here to say that Russia's aggression is a global threat. We see the Russian Federation committed cyber attacks in different corners of the world," said the President of the Verkhovna Rada from Ukraine, Andrii Parubii. In turn, Georgian Parliament Speaker said the challenges can only be overcome by the close cooperation of countries threatened by Russia. "We are united, we talked about what we share historically. We have the same aspirations, and that is the most important," said Irakli Kobakhidze, President of Georgia. The presidents of the four parliaments gathered in Washington, where they had a series of meetings with US officials.